In your hands, you hold something miraculous. This is more than just a workbook or a journal– it is a compendium of thought and philosophy for you to write in. It is your future, your past and your present all wrapped up into one grand, unassailable epic built to weather the ages and stand the test of time. It’s the world’s greatest novel in natus, it’s the key to your imagination, the doorway of fate where you leave your whispers and read what others have written in passing. It is a prayer book for every creed’s existence, a seven hundred page embryonic hymn of creativity designed to call forth the muses as you carry it with you like your own tablet of truth and pave your own way to your own vision of the world as it truly should be. 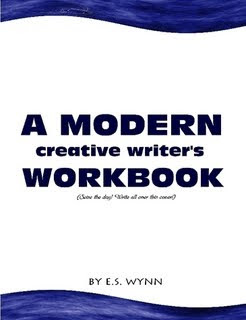 Featuring over 700 pages of diverse artistic, philosophical, scientific and other interesting and assorted musings, poetry, stories and prompts specifically designed to get you writing right now and right in the pages of this book, A Modern Creative Writer’s Workbook gives you everything you need, whether you are a hardened pro or just starting out on your writing path. Perfect for all writers of all ages, regardless of style or genre. This is definitely your workbook.